I'm proud to show you how AP is a professionnal tool. 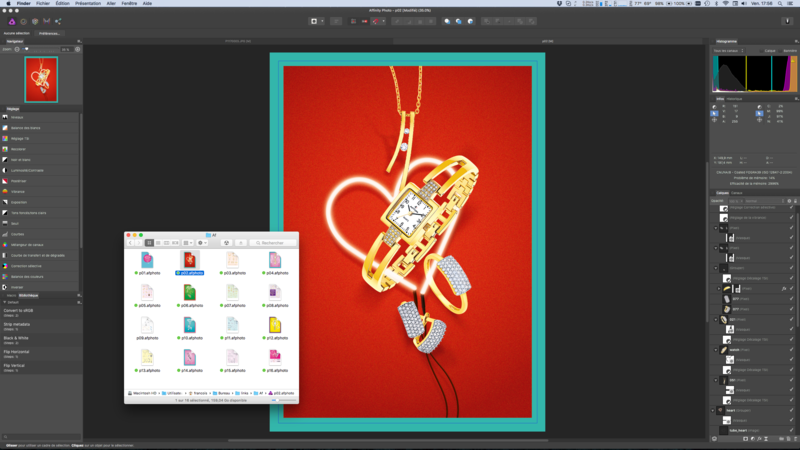 I'm near the end of the of a graphic design of a jewelry catalog for a major French retailer. It was a real challenge I want to succeed and it have been hard because of my 20 years of using Adobe tools ... but I did it ! Why using AP instead Photoshop ? Because of one particular thing : the non destructive effect when you resize au layer. This is really important when you compose a page with objects and you don't know what could be the their final size. In Photoshop this action is destructive and you loose lots of details by trying to find the good placement of your object, so you have to duplicate your object : one for the draft copy and the second one for the final placement ... and pray so that is the last décision of your costumer ! GREAT ! The second things are "move by whole pixel" and "force alignment of pixels" options, the best way to keep a sharp definition of your objects ! SO GREAT ! The third thing is exporting with Lanczos algorythmes ... SO SO GREAT ! 2- Improvments for gradient and color picker tools, actually they are too long to use. See you in few weeks ! Do you mean a linked file rather than an embedded duplicate for the "final" one? I see that Photoshop CC added linked smart objects based on a single referenced file. Having to update each instance would be a pain for that many sources. discussion is pointless. capturing it is NOT. but talent renders the image. But I smile because it's true and all my friends know it : I'm a hard worker because I love my job of graphic designer for 20 years. I had a lookout your excellent site - how did you do that scull? @ Brunzenstein : answer in PM.